Art: More than 800 pieces of artwork will be on display in Red Hook when the Brooklyn Waterfront Coalition presents "Art in Changing Perspectives" starting July 11. Film: See Brooklyn Heights-based author Tim McLoughlin's novel, "Heart of the Old Country," on the big screen, as the Brooklyn-based story is the basis for the independent film, "The Narrows," in theaters now. Music: Is America part of the world? In certain music scenes, that question begs to be asked, and Nation Beat founder Scott Ketner does so through his outdoor music festival July 11 at the BKLYN Yard in Gowanus, featuring local bands that defy genre conventions. Performance: The music of Elvis Costello comes to life with the The Badass Record Collection at the Brick Theater, starting July 9 at the Williamsburg venue. Columns: Pumps & Pleats hearts Swank in Sheepshead Bay, The Kitchen Klutz tries out Honey BBQ Hamburgers, just in time for the Fourth of July, and Mangiare Bene shares a favorite Sunday treat, stuffed "Pan PurBri"
In on the Wilco cult? 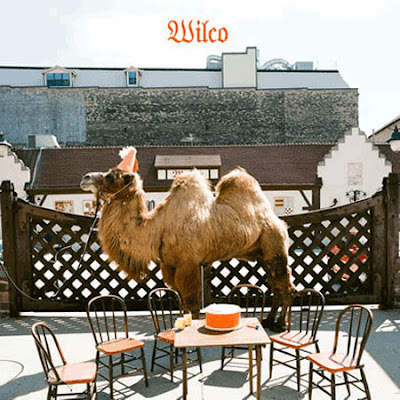 Celebrate the release of the band's news album, titled "Wilco (The Album)" tonight at the Bell House (149 7th St.) with a record release party. Listen to the new record (on which PopMatters says the innovative band plays it safe; Pitchfork agrees, calling it a "concise distillation of the band's strengths," but not their best work), try your luck at some prizes, and, if you like what you hear, buy it on CD or LP from Sound Fix. It starts at 7:30 p.m., and is free, with drink specials and food provided. The weekend is upon us. Here's a look at some of the events happening in a neighborhood near you. Film: JellyNYC and TOPSHOP host a private film screening tonight at The Bell House (149 7th St.), showing the Antonioni class "Blow Up." In addition to the film, the night features complimentary bike valet, drinks and, of course, pop corn. They'll also be giving away twenty $50 TOPSHOP gift vouchers, so you can add to bulk up on flirty dresses and shirts for the summer. DJ Mia Moretti spins the hits before the film. It starts at 7 p.m. with the movie at 9 p.m. and is free, just RSVP to pbicycleclub@jellynyc.com. Craftsmanship: Spend your weekend building a boat through a workshop at the Gowanus Studio Space (119 8th St.). It starts tonight with an information session and a late-night rowing session on, of all places, the Gowanus Canal. It costs $90 for the weekend, and you can register here. Burlesque: It's a blast from the past at DUMBO's Galapapos Art Space (16 Main St.) tonight with "Vaudvillionairs," with performances, from aerialists to musicians, inspired by Coney Island's heyday of Luna Park. It starts at 10 p.m., with tickets $15 in advance, $20 at the door. Print: Remember zines? Maybe you made one when you were a teenager. Despite the popularity of things like the Internet, the fan publications still persist, and on June 26 and 27, you can flip through ones made right in New York City at the Brooklyn Lyceum's Zine Fest, running noon to 7 p.m. at the venue, located at 227 4th Ave.
Art: Tour southside Williamsburg's galleries through a Williamsburg Gallery Association tour, led by art critic and art tour guide Merrily Kerr, a must-see for art lovers and the art-curious alike. Tours leave from the WGA table on Bedford Avenue between North 5th & North 6th Streets at 2 p.m. Tickets are $10 and can be purchased prior to the tour at the WGA table on Bedford Ave., or in advance here. Skating: It's a Beach Blanket Bingo Skate Party at Dreamland Roller Rink and celebrate summer in true style. Wear your swimsuit or summery beach attire for reduced admission to the party. With Michael Jackson music playing at the rink all weekend, you're also inspired to wear MJ-inspired attire. There will be also be a roller skating swimsuit contest, so dress for success. It's from 8 p.m. to midnight, with tickets $12 ($10 if you dress the part), with skate rentals $5. The rink is located at West 21st St at the boardwalk. Party: Winkel and Balktick are bringing a party along the Gowanus Canal with "The Love Canal," a "celebration" of the toxic canal at Bklyn Yard. Come dressed up as a mutant and dance to DJs and enjoy performers, bands, and art projects. The show is all ages, from 2 p.m. and 9 p.m., and is free before 4 p.m., $7 after. Festival: Take in Irish music, food, dance and sports at the Brookyln Irish Festival, a two-day festival at Floyd Bennett Field. Tickets are $10, $15 after 4 p.m., and free for kids. Gates open at 11 a.m. 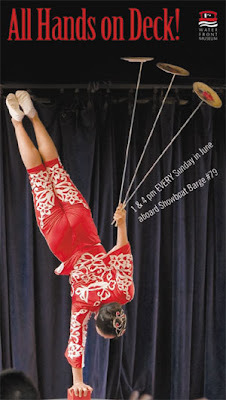 Circus: It's the last day Sunday of CIRCUSundays at The Waterfront Museum (290 Conover Street) in Red Hook. Don't miss out on European intimate circus at its most breathtaking, as it brings David & Paris, a tip top magician and a hip-hop juggler; veterans of Las Vegas resorts and the Apollo Theater in Harlem. Tickets are $14, $10 for kids (under age two are free); $18 and $12 at the door. Food: Unpretentious foodies unite at the UnFancy Food Show, featuring book signings, food and drink specials of local produce, at the East River Bar (97 S. 6th St) from noon to 6 p.m. Tickets are only $5. Seminar: Learn the dos and dont's of book in New York City at The Bell House's No Guest List event. Hear from some of the city's top bookers, with Eugene Mirman hosting. Tickets are $5 and are available at the door. It starts at 8 p.m. There will soon come a day -- if it hasn’t already come -- when Hollywood slowly begins to realize that audiences would much rather play with the cardboard box than the big, shiny, expensive toy that comes inside. There are plenty of shiny toys in Michael Bay’s latest installment of the Transformers -- both metallic and otherwise. But like a kid on Christmas morning who plays with his new, super-cool radio-controlled car for all of 10 minutes before promptly returning to his old collection of green army men, there’s not much here to sustain interest for any significant length of time. The morphing robots are certainly a hoot-and-a-half when they’re rocking and rolling and Megan Fox provides enough eye candy to put you in a diabetic coma. But the stuff that passes for entertainment between these two bookends is mediocre at best. The ubiquitous Shia LaBeouf is affable enough as the Terran slub who holds the key to the intergalactic war between the evil Decepticons and virtuous Autobots in his head, but the plot is so insufferably cliched that it seems like forever before the next Transformer fight or Fox sighting. 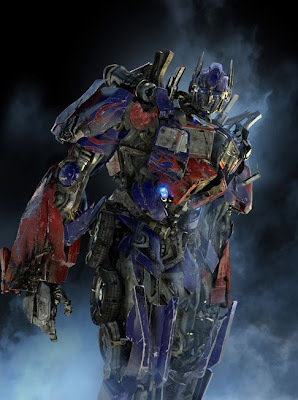 “Transformers: Rise of the Fallen” is a fatally flawed movie based on a ridiculous premise. Just because a giant toy looks cool on screen doesn’t mean it’s a movie. The upcoming “G.I. Joe” at least has some kind of cockamamie plot built in. Directed by Michael Bay, starring Shia LaBeouf and Megan Fox. Run time 150 minutes. Rated PG-13. 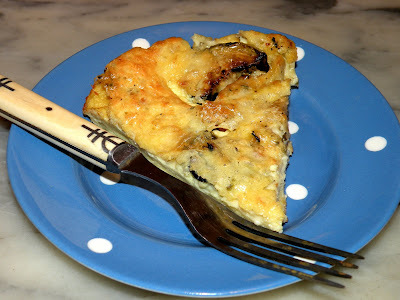 When I’m looking for an easy-to-prepare main dish which is both flavorful and nutritious, I often fall back on my version of a recipe for crustless quiche which I acquired a couple of decades ago from a co-worker. I am apt to make the quiche when I have leftover cooked vegetables, such as a melange of sweet peppers, onions and garlic quickly sauteed in olive oil and spiked with fresh basil, or chunks of zucchini, onion and tomatoes that have been marinated in olive oil, lemon juice, garlic, salt and pepper and grilled. In fact, I often make a double recipe of vegetables because I’ve planned to make a quiche the following day. The recipe I originally made was straightforward. It combined steamed broccoli or spinach with cheddar cheese, eggs, milk and flavorings to make a main-dish custard that was both easy and substantial. With a salad and a loaf of crusty bread, the quiche was more than adequate for a weeknight dinner. And, because it had no crust, it could be whipped up in just a few minutes, and on the table after 35 to 40 minutes of baking. Over the years, I found myself varying the original formula. Sometimes I use cheddar cheese; at other times, I use mozzarella, Swiss, Jarlsberg or pepperjack cheese -- pretty much whatever hard or semi-hard cheese I find in my refrigerator that I think will accent the vegetables I have available. I do adjust the amount of milk to accommodate the relative softness or hardness of the cheese I’m using. While half a cup works well for the cheddar, you probably need less with the mozzarella or pepperjack. As for the veggies, it really is dealer’s choice -- whatever vegetable you have or like, in whatever combinations you prefer, with whatever herbs or spices you want as grace notes. One note of caution: The vegetables should be cooked, but not mushy, as they will continue to cook once the quiche goes into the oven to bake. Liberally grease a 9" porcelain quiche pan. Scatter half of the grated cheese over the bottom, Then, add the vegetables, making sure they are evenly distributed around the pan. Set aside. In a mixing bowl, add the milk to the flour till the flour is dissolved. Add salt and pepper to taste. Set aside. In a second, larger mixing bowl, beat the eggs until frothy. Add the milk mixture to the eggs and beat again. Pour the egg-milk mixture into the quiche pan. Top with the remaining grated cheese, distributing it evenly. Put the quiche on the middle rack of a cold oven, set to 375 ° F. Bake for 25 minutes, then rotate 180° and bake for an additional 10 minutes until Quiche is golden on top, puffed and a cake tester inserted into the custard in several locations comes out clean. Let stand five minutes, then cut and serve. Serves 4-6 as a main dish. A Food Network star is in my kitchen! Sunny Anderson, the delightful host of not one but two shows on the TV channel — “Cooking for Real” and “How’d That Get On My Plate?” — visited me (yes, me!) to save me from my klutzy ways. Armed with a long wooden spoon, a sense of humor and a beaming smile (Food Network stars’ smiles are just as bright in real life), Sunny and I set out to make her recipe for Corny Mango Salmon. The pressure was on. Seriously, I couldn’t massacre Sunny’s dish right in front of her. That’d be rude. So I prepared. Before Sunny’s arrival, all the ingredients were diced and sliced and secured in their own little containers. It was almost like a real Food Network kitchen! I had planned ahead and was totally ready! Sunny needed a sauté pan to reduce mango nectar and chunks of the fresh fruit. Apparently, I provided a frying pan. What? I thought it was a sauté pan. Since I didn’t have the elusive sauté pan (damn you pan! ), I shamefully took out a wok. Sunny was a sport and assured me it would work. She’s so nice! A couple steps later, we prepared to pour oil into a frying pan (see, it came in handy!). But I had the wrong kind. Strike two. After that, we discovered that the cornmeal was too coarse. All my planning was going to waste! And that giant wooden spoon was lying in wait like my very own culinary menace. Ignoring that dumb spoon and refocusing on the stove, Sunny and I prepared to place the salmon fillets, which were coated in flour and the evil cornmeal, into the frying pan — full of the wrong oil. Now, if I had been on my own, I probably would have taken the whole fillet, held it six inches above the pan and dropped it right in. Hot oil would have surely splashed all over me and I would have surely screamed in pain. But since Sunny was here, she taught me a way to get the salmon in the pot without suffering third degree burns. It’s actually rather simple. Take the fillet and slowly place one corner in the pan, then continue to roll it in (away from your body!). Voilà! Super simple and yet gave me a massive sense of accomplishment. And even if I do get burned, apparently my pain threshold, which is currently at a negative four, will eventually increase. There’s probably a lot more kitchen mishaps in my future before I’m that tough. After a few minutes on the stove, the salmon was placed in a serving dish and covered with the gorgeous mango puree. Verdict: Sunny is really smart! Corny Mango Salmon is sweet, crispy and melt-in-your-mouth delicious! An extra tip from Sunny — any leftover mango sauce can be used as a topping on ice cream. Sweet! “Ice cream is where it’s at for this,” Sunny said with a smile. Oh, if you’re wondering, Sunny never whacked me with the spoon. Instead, she hugged me! 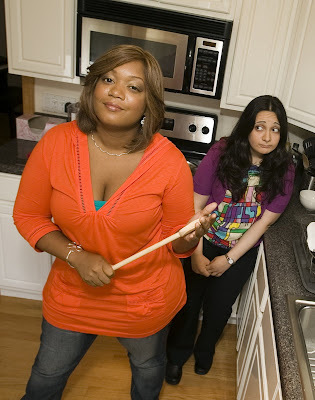 Have a recipe for the Kitchen Klutz? Want to share a tip? Send ’em to MDemeglio@CNGLocal.com. “Cooking for Real” airs on the Food Network at 4 p.m. on weekdays, noon on Saturdays and 10:30 a.m. on Sundays. “How’d That Get On My Plate?” is a special primetime series. Check your local listings for airtimes. In a small saucepan over high heat, bring mango nectar and mango to a boil. As mango begins to break down, press with a fork or potato masher to mash it. Continue cooking until mango cooks down and forms a chunky puree, about 15 minutes. Remove and reserve half of the mixture to serve as a sauce. Set the other half aside for glazing. On a large plate, mix together flour, cornmeal, sugar and salt. Preheat a large skillet over high heat. Season salmon with salt and freshly ground black pepper. Brush glaze over the top of the salmon, then dredge in cornmeal mixture. Add oil and butter to the skillet. Over high heat, sear salmon cornmeal side down until golden, about 6 to 8 minutes for medium rare, flipping halfway through to crisp the skin. Place on serving plates and serve with reserved mango sauce. Picture this: You’re nine years old, walking into a fully-stocked candy shop. The shiny red, blue and green plastic wrappers are calling your name. The hunger is so intense that your eyes dart everywhere, your step gets lighter and your pulse quickens. You don’t know where to turn first but one thing is certain — you must get to that Sugar Daddy pop OR YOU WILL DIE! That same overwhelming feeling ripped through me when spotting the gloriously candy-colored leather handbags in Hayden-Harnett’s Design Shop in Greenpoint. Walking into the cozy store is a religious experience for those wealthy enough to purchase luxury goods — and penny-pinchers who ogle the purses on Hayden-Harnett’s Web site and can’t believe they’re seeing the real thing in person. I fall into the latter category, by the way. During my recent Sunday afternoon visit, my brain went into overdrive and my body froze upon seeing row after row after row of satchels, totes, clutches and wallets — oh my! I couldn’t decide what perfect purse to paw first! Dropping the Bedford (ever so delicately, of course), I ran to my own personal heaven — a full wall of leather bags. With its cool colorblock style, the $598 Clara flap bag is a hometown hero among local handbag lovers. In shades of blueberry (just as yummy as the fruit) and moonbeam (an iridescent mother of pearl), the bag is decadent, divine and can make admirers down right delirious with devotion. It’s even adorned with a humongous circular signature lock in seafoam green and orange sherbet shades. So tasty! The brains behind Hayden-Harnett — designer Toni Hacker and Ben Harnett, who handles the business end — have thought of absolutely everything a true urban gal needs in a fashion-forward yet functional tote. With a few simple snaps, zips and buckles, many of their creations transform from shoulder bags to clutches or from totes to crossbody sacks. The most impressive is the über popular Ibiza Convertible Flight tote. For $198, you too can change this baby from a shoulder bag to a sling or fold it in half for a compact companion or even mold it around a yoga mat for the ultimate in inner peace chic. Squeal inducing! My favorite Havana color is called Ginger (also the best Spice Girl!). It’s a juicy shade of orange — and comes with a delightful rainbow print lining. Is there anything better for summer? Duh, no! The priciest purse in the place is also one of the most fabulous — the $725 Wyeth tote. Combining rich leather and bohemian fringe, the bag is big, bold, comes in cool colors like Eucalyptus and - OMG, I need one!! Okay, okay, time to calm down. Maybe that’s enough bag hunting for today. Hayden-Harnett’s Design Shop is located at 211 Franklin Street. For hours, call 718-349-2247. On July 7, a taste of Vegas comes to Brooklyn, when the swankiest lounge singer in action, Richard Cheese, brings his corny, crooning act to the Music Hall of Williamsburg with his band, Lounge Against the Machine. The alter-ego of Los Angeles-based comedian Mark Jonathan Davis, for the past several years, late-night TV favorite Cheese has been bringing plenty of it to nightclubs across the country, performing familiar tunes like “Baby Got Back” and “Sunday Bloody Sunday” but with swing, and, in the latter’s case, an unexpected bit of mambo as well. Sound cheesy? It sure is, but it also makes for great, kitschy entertainment. With his voice as cocky as it is smooth, Cheese is impeccably backed by his jazz trio of Bobby Ricotta on piano, Frank Feta on drums, and Billy Bleu on bass. In his tiger-striped tuxedo and slick hair, the singer is not the only one dressed up for the act. Fans have been known to be inspired literally and come to shows sporting cow costumes, as well as gigantic hats shaped by cheese wedges. Those fans have helped propel Cheese to over 175,000 albums sold, among them his debut, 2000’s “Lounge Against The Machine,” as well as “Tuxicity,” “I’d Like A Virgin,” “Aperitif For Destruction,” and, most recently, “Viva La Vodka,” a live album which features such “classics” as 2 Live Crew’s “Me So Horny,” the Pussycat Dolls’ “Don’t Cha’,” and AC/DC’s “You Shook Me All Night Long.” Minus such throwbacks as AC/DC, the track lists on his albums reads like a “Now That’s What I Call Music” album (a look at “Lounge Against The Machine” is quite the blast from the past, for anyone tuned into contemporary radio circa 1999). Going strong for nearly 10 years now with this material, from a total of eight albums to hundreds of performances world-wide, this will be the last time you can see Lounge Against the Machine play in New York. After this year, Davis is done touring with Lounge Against The Machine, partly due to stress on his vocal chords, and also to pursue other projects. With a new lineup of Hawaiian songs, including the exotica album “Lavapalooza” slated for release next year, a whole new swinging act may be coming to Brooklyn. 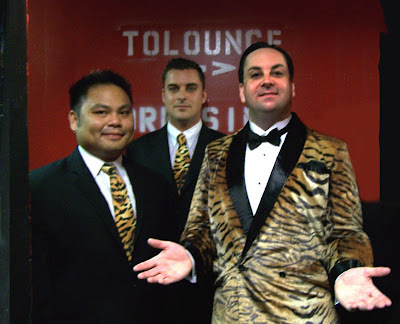 For now, don’t miss Richard Cheese & Lounge Against the Machine when they play the Music Hall of Williamsburg (66 North 6th St.) July 7 at 8 p.m. Tickets are $35. For more information, call 718-486-5400. North Brooklyn is hip to music festivals. In the wake of the Northside Festival, the four-day music extravaganza that took over North Brooklyn, another weekend festival featuring some of Brooklyn’s best live acts is coming to Bushwick. Albeit on a much smaller scale (there won’t be any venue hopping or badge-wearing this time around), these shows, curated by record labels Woodsist and Captured Tracks and put on with DIY producer Todd P, is drawing up its own buzz for the stellar line-up of DIY artists and lo-fi bands. On July 3 and 4, more than a dozen local acts will converge in Bushwick at Broadway Backyard, for an all-ages, outdoor show that’s expected to get loud. Maybe you’ll catch an illegal fireworks display lighting up the night sky as well at the Fourth of July show. Headlining the two-day affair are Crystal Stilts, playing their garage-pop the first night, and Thee Oh Sees, an experimental, instrumental group, the following night. Also on that bill are the Vivian Girls, who made news last year with their very fast, very catchy pop, and anticipate a follow-up album later this summer. 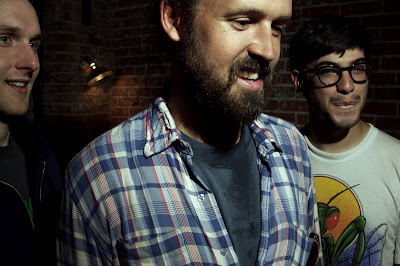 Woods is the band behind the label Woodsist, and naturally, they are on the bill too, with a spot on the July 4th lineup. The Bushwick-based band has pulled from some of their favorite acts and label mates (such as Vivian girls and Crystal Stilts) for the festival, which in turn makes for a dream lineup of acts that you’d expect at an all-ages, outdoor summer show in the middle of Bushwick. Scheduled to play on Friday, July 3, as of press time, in addition to Crystal Stilts, are Blank Dogs, Psychedelic Horses—t, caUSE co-MOTION!, the Mayfair Set, Gary War, Little Girls, Kid Romance, Beachniks, and the Gutsies. On Saturday July 4, in addition to Thee Oh See, Vivian Girls, and Woods are Kurt Vile, Tyvek, Dum Dum Girls (kind of like the Vivian Girls with their shoegazer pop), the Fresh & Onlys, Brilliant Colors, Ganglians, the Great Excape, the Beets, Real Estate, German Measles, and Beach Fossils. In other music news, on the horizon in North Brooklyn, of course, are the Pool Parties, which, while not in a pool anymore, retain their cool moniker. This summer, the widely popular free concerts will move from McCarren Park to the Williamsburg waterfront, in the East River State Park, between North Eighth and North Ninth Streets. Unofficially scheduled to kick off the series on July 12 are Mission of Burma, F---ed Up and Ponytail. Other rumored bands set to play include Brooklyn’s Dirty Projectors on July 19, Dan Deacon on August 2, Girl Talk on August 23, and, another big Brooklyn indie act, Grizzly Bear on August 30. Until then, get your fill of the local talent at the Woodsist and Captured Tracks festival is July 3, starting at 3 p.m., and July 4, starting at 1 p.m., at 979 Broadway Backyard (between Myrtle Avenue and Ditmars Street). Tickets are $15 each day (click here to buy for July 3 or July 4), or $25 for both. The event is rain or shine. Irish eyes will be smiling this month when an Irish festival comes to Brooklyn’s Floyd Bennett Field. On June 27 and 28, the Brooklyn Irish Festival will take over Hangar 5, with Irish step dancing, Gaelic football, and, of course, music, taking centerstage. In particular, the popular and long-standing Irish trio The Wolfe Tones, making the Northeast Irish festival circuit as of late, will headline Brooklyn’s own, playing the evening of June 28. Regulars in the borough after playing annually at Our Lady of Perpetual Hope in Bay Ridge for over two decades, the band is looking forward to coming back to Brooklyn with their entertaining as well as informative show, which features images projected to illustrate the themes of the songs and help tell the story of Ireland. Other acts scheduled to appear include Patty Smyth, Pat McGuire, Jameson’s Revenge, The Moonshiners, and Seanchai and the Unity Squad, and bag pipers will provide traditional sounds as well. Local Irish dance groups will also provide entertainment, including from the Donny Golden Dance School on Saturday and the Niall O’Leary Dance School on Sunday. Know a step or two? A family ceili, or social dance, will take place during the weekend, as well as dance workshops so you can get in on the jigs yourself. There won’t just be dance and music to help celebrate Irish culture in the city; on Saturday, June 27, the New York and the Brooklyn Shamrocks teams will face the Long Island Gaels in two separate Gaelic football games. The following day will see an NYPD Gaelic football game, as well as rugby, with the Rockaway Old Boys playing Young Gunners. Between the sets and games, you can browse an Irish bookstore, supported by Barnes & Noble, as well as hear readings from Mary Pat Kelly (“Galway Bay”), Alfie McCourt (the youngest of the McCourts and the author of “A Long Stone’s Throw”), New York Times writer Dan Barry, author of the memoir “Pull Me Up,” about growing up Irish and Catholic in Long Island, and Peter Quinn (“Looking for Jimmy: A Search for Irish America”), all scheduled to appear on both days of the festival. A certified family affair, there will be arts and crafts, as well as a kid’s zone, featuring a bounce house, slide and face painting. Aviator expects anywhere between 5,000 to 10,000 people to head to Floyd Bennett Field to celebrate in Irish culture. For the hungry masses, there will be Irish dishes such as fish and chips, roasted leg of lamb, shepherd’s pie and corn beef sandwiches as well as hamburgers, pulled pork sandwiches, and grilled sirloin steak, among other items, on the pub menu. With the wide range of events in what will continue to be an annual summer event, you can feel comfortable bringing the whole family. The Brooklyn Irish Festival will be on June 27 and 28 at Floyd Bennett Field (3159 Flatbush Ave.) Gates open at 11 a.m. Admission is $10 ($15 after 4 p.m.), and free for children under 12. For more information, call 718-758-7513. Coney Island Boom-A-Ring opens with a bang! To an avalanche of “ooohs” and “aaahs” from spellbound spectators, electrifying daredevils, awesome acrobats and a cavalcade of jungle animals converged under a blue and gold Big Top to kick off a whole summer’s worth of heart-pounding hijinks in Coney Island with the opening day of Ringling Bros. and Barnum & Bailey’s Boom-A-Ring Circus — attended by Mayor Mike Bloomberg, aptly attired in a top hat. The “Greatest Show on Earth” made its sensational splash with the first of 84 shows planned along the boardwalk at West 21st Street and Surf Avenue, wowing the crowd with dazzling feats of human accomplishment against the backdrop of a charming one-ring circus, the first big-top extravaganza Ringling Brothers has produced under a tent since 1954. In synchronized displays of wonder, aerialists and high-wire troupes leapt and soared to lofty heights, a majestic pack of white Bengal tigers and Asian elephants moved the audience to a hush and a funnybone-tickling crop of clowns ushered in the giggles. State-of-the-art electronics enhanced the non-stop thrills, which were further amplified by the traditional sounds of a circus band. View the rollicking extravaganza, featuring a rip-roaring roster of performers — including the Urias family, known as “The First Family of the Motorcycle Globe”; The Negrey Troupe, a world-renowned retinue of Russian acrobats making their New York debut; and “Eccentric Personality Extraordinaire” Justin Case — through September 7. Performances will take place on Thursdays, Fridays, Saturdays and Sundays, and tickets start at $10. Arrive an hour before show time for the All Access Pre-show, which is free to all ticket holders, and meet Ringling Bros. performers and animals, learn circus skills and enjoy a taste of the circus before the show even starts. Monika Wuhrer is always making something. The co-founder of the Brooklyn art space Open Source, the German-born artist is known to have a hammer in her hand and blueprints at her feet. “People who know me on the block know there’s always something going on in the house,” says Wuhrer, who lives next door to the gallery with its other founder, her husband, Gary Baldwin. Her most recent project is a foozeball table, which she plans on displaying in her gallery for both play and exhibition. “When I do something, everybody’s invited to play with it,” she says. Wuhrer looks to instill that same spirit of creativity into Brooklyn kids with this summer’s soap box camp. From July 13 to August 7, the gallery will host a weekly camp for kids ages 7 to 12 to build something of their own: a soap box, out of recycled, found materials. Wuhrer, a mother of three whose eight-year-old son is excited to take part in camp, will lead the workshop with her friend, the artist Hubert Dobler. Together, the two will introduce the kids to different tools and supervise them closely while they build their contraptions with hammer, nails, handsaw, screws, etc. Besides hands-on building, they will encourage the kids to plan on paper and make drawings of their inventions, as well as think outside of the (soap) box. Registration is now on a first-come, first-serve basis, and, with only five slots each week, and some of the first weeks already filled, interested campers are encouraged to apply now. And though the soap box is something commonly seen as a father-son activity, young girls are encouraged to sign up as well. Wuhrer also encourages interested campers to start looking for materials right now that could be turned into little makeshift race cars – discarded strollers, push-carts, wooden boxes – anything that has wheels or that you could easily affix then to. The first part of the camp will involved collecting these materials and drawing ideas on paper, then building. By the end of the week, the campers will decorate their soap boxes, all the while testing their creations a half a block away in South Slope. The camp culminates, fittingly, with a derby on August 8. Brooklyn has a strong interest in its soap box derbies, with the annual Paping Soap Box Derby in Brooklyn Heights becoming so popular that the event’s organizers had to cancel it last year. Kids and adults alike are invited to come out and race in Open Source’s derby on 17th Street. This year, it’s soap boxes; each summer, Wuhrer looks to bring a camp to South Slope that gets children exploring their own ingenuity. Open Source Gallery’s camp runs weekly from July 13 to August 7, Monday through Friday from 9 a.m. to 1 p.m. Cost is $250 per week and includes materials. Interested campers can e-mail info@open-source-gallery.org if interested, and, if space permits, can download a form at www.open-source-gallery.org and send it to: Monika Wuhrer: 257 17th street, Brooklyn, NY 11215, including a $50 deposit. Those interested in participating in the August 8 derby should also email info@open-source-gallery.org for a head count. For more information, call 646-279-3969. Just a reminder: Zs, the Bushwick-based avant-garde instrumentalists, celebrate the release of their 12", "Music of the Modern White," tonight in Williamsburg at Secret Project Robot. The band is currently profiled in our latest issue of 24/Seven, so check them out! Tickets are $8 for the 8 p.m. show, which also includes an issue of "Music Of The Modern White." Secret Project Robot is located at 210 Kent Avenue. 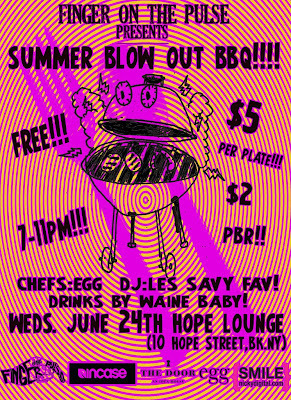 The latest installment of Finger on the Pulse returns to Hope Lounge in Williamsburg, where local eatery favorite Egg catering the BBQ blow out, with pulled pork, baked beans and, for dessert, cookies promised. Also supplying the sounds are the Brooklyn-based post-punk band Les Savy Fav. It starts at 7 p.m., with food for only $5. Hope Lounge is located at 10 Hope Street. For the past few weeks all the attention has been on the Boom a Ring circus coming to Coney Island, but for years, Brooklynites have been entertained on another waterfront. CIRCUSundays at The Waterfront Museum in Red Hook, New York’s acclaimed little big top by the sea, celebrates 13 seasons this year, and this year's comes to a close June 28 with performances at 1 p.m. and 4 p.m. This Sunday show is European intimate circus at its most breathtaking, as it brings David & Paris, a tip top magician and a hip-hop juggler; veterans of Las Vegas resorts and the Apollo Theater in Harlem. Also on the bill is Li Liu, award-winning acrobat from Chinese National Circus and Ringling Bros. who presents a dazzling Risley act and her signature one-armed hand balancing. Also catch Hilary Chaplain, Brooklyn’s Clownesse. Out of each well-choreographed cacophony of chaos, she steps lithely like a ballerina. Joshua Dean offers aerial artistry, which has earned him accolades throughout the country. The Waterfront Museum is located at 290 Conover Street, across the street from the Fairway Market in Red Hook, Brooklyn. Tickets are $14, $10 for kids (under age two are free); $18 and $12 at the door. The tour stops off in Brooklyn tonight, with a show at the Union Hall with The Black Fortys and Two White Horses. Expect blood on the keys. It starts at 7:30 p.m., with tickets $8. Union Hall is located at 702 Union Street. 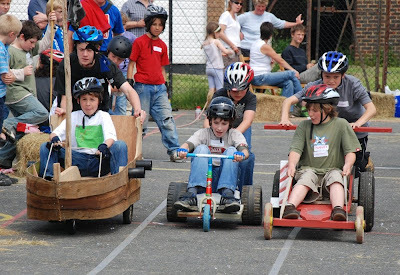 Camp: Have your kid use his hands this summer and learn how to build something at the Open Source Gallery's summer camp, where campers will assemble their own soap boxes to race at a derby on August 8. (Kids of all ages are invited to participate, so get working on that soap box now). Festival: Irish legends The Wolfe Tones headline the Brooklyn Irish Festival, two days of music, food and dance at Aviator on June 27 and 28. Music: Hear hits from groups like Britney Spears and Radiohead like you've never heard them before when lounge lizard Richard Cheese and his trio, Lounge Against the Machine, come to the Music Hall of Williamsburg July 7. Circus: Ringling Bros. and Barnum & Bailey's Boom A Ring Circus opened last week in Coney Island, and our photographer was there. See the sights and learn more about the big-top event. Columns: The Kitchen Klutz is cooking up Corny Mango Salmon with none other than the Food Network's Sunny Anderson, The Reporter's Table serves up an old standby, crustless quiche, and Pumps & Pleats feels like a kid in a candy store at Greenpoint's Hayden-Harnett’s Design Shop . Our own columnist at Pumps & Pleats hits the stores each week in search of unique finds and shines a spotlight on some great local businesses. Hip Slope Mama is calling on shoppers to do the same and spend some of their dough locally. Well, the call actually comes from Mark Caserta, owner of Park Slope's 3r Living. The idea? Pick your three favorite small, locally-owned businesses and spend at least $50 total in theses stores on a monthly basis. It's called The 3/50 Project, and its it's own economic stimulus plan, for if half of the employed population spent $50 a month on locally-owned businesses, it would generate $42.6 billion of revenue. The move could help prevent storefronts from becoming vacant, and infuse some money into your neighborhood. Don't have the money to spare? Brokelyn has a solution: be chintzy with your staple purchases but do all your splurgy gift shopping at the local places. Drain liquid from chickpeas. Place in food processor with tahini, garlic and lemon juice. Add salt as desired. Process for several minutes. Drizzle olive oil and process until mixture is smooth. Taste before serving to ensure creamy texture. Plate mixture. Top with paprika. Serve with pita bread. It's finally upon us. If you don't mind some summer showers, then you'll have a blast this weekend. Here's a look at some of the events happening in a neighborhood near you. DJ: Lounge around and tear it up with DJ Eli "Paperboy Reed" (of the soul-revival act) tonight, as he plays his favorite soul and R&B 45s at The Bell House (149 7th St.). It happens from 10 p.m. to 2 a.m. in the front lounge, and is free. Party: After checking out selections at the NYC Bicycle Film Festival, head over to the the afterparty at Public Assembly (70 North 6th St.), hosted by Cycle Hawk and featuring Goldsprints, DJ James Mulry, and other speicial guests. It's free, with an open bar from 10 p.m. to 11 p.m. courtesy of Brooklyn Brewery. Parade: It's now summer. The Mermaid Parade returns to Coney Island this weekend, promising half-naked sealife and the revelers to come to gawk and celebrate. It happens rain or shine starting at 2 p.m. at West 21st Street and Surf Avenue. Stick around for the official ball at Dreamland Roller Rink, with skating sessions at 5:30 p.m. and 9 p.m.
Games: While reading the Harry Potter books, did you ever want to grab a broom and play quidditch yourself? Well, today, you can make the first step towards that and see a real-live version in action (you can also see footage here). It's organized by MTV to promote the upcoming film, so it's not exactly a grassroots game, but it should still be interesting to watch (fans can email mtvcasting09@gmail.com for more info). It's from noon to 6 p.m. at McCarren Park (Nassau Avenue and Bayard, Leonard and North 12 streets). Music: In other Harry Potter news, the band Harry & The Potters plays The Bell House this night as well for an all ages show. Joining them on the bill are The Remus Lupins and The Whomping Willows. It all starts at 5 p.m. and is free. Film: Watch the Mexican sci-fi classic “La Nave de los Monstruos” ("The Monsters’ Ship") live on a big screen at Prospect Park, while the bands ETHEL and Gutbucket play a live score, as part of the Celebrate Brooklyn! festival. Audience members can also get involved a la "Rocky Horror Picture Show." It starts at 7:30 p.m. at the Bandshell (Prospect Park West and 9th Street) and is free. Festival: The Brooklyn Hip-Hop Festival returns to the DUMBO waterfront, with headliner Pharoahe Monch and DJ Premier, Grand Puba, Donny Goines, Tiye Phoenix, Nyle, Keys N Krates, Eagle Nebula, MC Styles P, Smif N Wessun, and J Period also on the bill. It happens from noon to 8 p.m. at Empire Fulton State Park, with a suggested donation of $10. Then, head to the offical afterparty at Southpaw (125 Fifth Ave.), hosted by Legendary Buckshot and featuring The Cypher (from Peter Rosenberg’s ‘Noisemakers’)DJ JS1, 8thw1 and more. It starts at 9 p.m., with tickets $10, less with a ticket stub. Comedy: It's an all-star lineup at The Bell House today with the weekly comedy show Tearing of the Veil of Maya (kicking off the summer at the Gowanus venue as opposed to its usual home at Union Hall). Scheduled to appear are Janeane Garofalo, Mike Birbiglia, Todd Barry, and John Mulaney, as well as host Eugene Mirman. It starts at 8 p.m., with tickets $10 (I would definitely buy them in advance). Music: Hear music everywhere today, and not just at the usual suspects, through the Make Music NY festival. To find out locations near you for some summer sounds, go here. You can also make some yourself through the new Mass Appeal program, so break out that bagpipe if you have it. This week in our Courier Life papers, some interesting developments in DUMBO. The Brooklyn Heights Courier reports that St. Ann's Warehouse has only two more seasons at 37 Water Street before it ha to make way for the Dock Street project, in which a 17−story apartment and school complex will be built. St. Ann’s Warehouse Founder and Artistic Director Susan Feldman is casting a net out for possible future locations, which may include moving the 30-year Brooklyn institution to Manhattan. Also along the waterfront, the Brooklyn Bridge flea market has drawn hundreds of shoppers to the area, as well as complaints from nearby residents. I had a serious problem with it. I will give them a little benefit of the doubt, but at 7:30 a.m. on a Sunday morning I don’t like to be awakened like a carnival came to town. They blocked the whole of Water Street loading in like a bunch of carneys and at 6 p.m. It was the same thing when they loaded back up, and they blocked the street. The flea market organizers had similar issues with their Fort Greene market, which were able to be resolved. So chances are the same steps will be done here. Live in the neighborhood? Enjoy the flea? What are your thoughts on the matter? Each year we open the summer season with a Memorial Day BBQ. Like most families, that means hot dogs, burgers, chicken, and salads. But I’m Italian and pasta has to be featured on the menu -- no, not elbow macaroni salad, but pasta. If it’s not on the agenda, the meal isn’t complete and I don’t feel like we had a celebration of anything. A holiday feast, even if it’s an all-American one, without pasta is just another cookout. Whether cold or hot -- doesn’t matter, as long as it’s there. For the past two years, the family ‘Q’ has been at Mary and John’s house. Basically they open their pool before I do and their house is bigger. When I asked Mary what to bring, other than my husband’s birthday cake, she said, “Pasta salad, maybe tricolor, something different.” Okay, tricolor pasta salad it is. 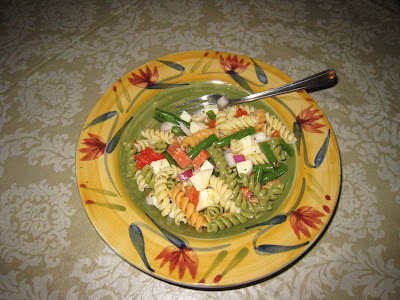 I looked through my collection of recipes and I came up with this easy tricolor pasta and cheese salad. It has no mayonnaise in it so it’s safe for outdoor parties or picnics, can be served warm or cold, it’s relatively inexpensive to make, feeds a horde, and can be made two to three days in advance. In fact, the longer it sits the better. Cook the pasta according to instruction (al dente - it holds up better to the dressing). Put about 2 inches of water in a skillet, bring to a boil. Add string-beans, cover, bring back up to a boil, then lower to a simmer for about five minutes or until tender (in a pinch you can use frozen beans, heating them up in the microwave). Drain pasta and string beans, rinsing both in cold water to stop the cooking. In a large bowl, put cubed mozzarella, pepperoni, diced onions, and sliced roasted red peppers. Then add the cooled pasta and beans. Dressing - in a jar - add the white wine vinegar, dried basil, salt, pepper, mustard and honey, slowly whisking in olive oil until emulsified. Pour dressing over the salad, mixing well. Chill two to three hours before serving and mangiare bene! **Check back Monday for this recipe! 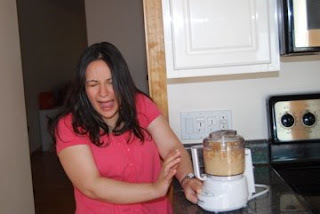 I have recurring nightmares about chickpeas. Growing up in Starrett City, my single mother sometimes struggled to put dinner on the table so we often hung our heads in shame and sulked into Pathmark’s generic food aisle for canned goods. Among the stark white labels was a can my mother always turned to — chickpeas. I hated chickpeas. To my young palate, which favored Cheez Doodles, chickpeas tasted like sand. Icky, yucky, wet sand. Even when I protested, she made me eat them because, hey, Cheez Doodles were expensive. If I really threw a fit, I had to eat a salmon croquette. Yup, the fish was also from a can. Shudder. Considering the torture of my youth, I still cringe when coming face to face with chickpeas. In fact, the mere presence of a single chickpea too close to my plate is enough to turn my stomach. Needless to say, when a kind-hearted friend suggested I try hummus last year, I all but fell to the ground in convulsions. It took about seven months and lots of prodding but I eventually placed an itty-bitty dollop of hummus on a cracker. Revelation — it was good! Since then, I’ve lived off the stuff. I have it with pita for a late-night snack or in sandwiches as a spread. So I was obviously excited to make the creamy concoction last Sunday. Everything seemed to start out okay. After tossing the garbanzo beans in a food processor, I added garlic and tahini. (Was I supposed to buy sesame tahini? It was an awful brown color. And overpriced.) I squeezed in the juice of one lemon. In doing so, I dropped a lemon seed into the machine but tried to fish it out with a tablespoon. Sadly, that seed was never seen again. With a few — okay, a lot — of chop and grind processing, I thought the mixture was ready. It looked like hummus but seemed a bit off. Verdict: I screwed up. The recipe I followed didn’t say anything about olive oil. Apparently, you’re supposed to add olive oil while the garbanzo beans are being processed. That’s what makes the mixture smooth and creamy — and edible. My creation tasted like Elmer’s Glue and was so thick that it rolled around the Tupperware container like a baseball. Tasty? I spit it out. Funny? When I served it to my colleagues it was! Currently, my fridge contains an untouched package of my favorite hummus but I can’t bring myself to open it. I’m sure that one day, I’ll be able to enjoy hummus again. But I’m never eating chickpeas. There’s Brooklyn pride and then there’s 80s Brooklyn pride. I gotta say, the kitschy 1980s version is much more fun. If you check out Mini Mini Market in Williamsburg, you’ll be greeted by a massive jewelry case loaded with Kings County-themed pieces that MC Lyte would’ve proudly worn. 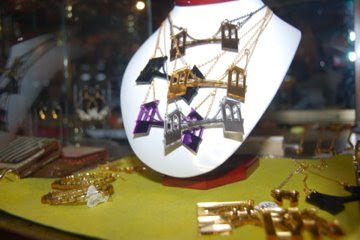 The coolest has to be the Brooklyn Bridge necklace by Brookadelphia for $50. Sitting on a 14K gold fill chain, the bold pendant measures nearly three inches long and features the full bridge. Pull your hair into a side ponytail, secure with a pink scrunchie and you’re 80s fabulous! There’s another faux-gold pendant in big block letters spelling “BKLYN” and made to reflect light like a mirror. That will definitely garner attention on Bedford Avenue. If you really want to send a message, pick up the $20 Brooklyn Double Finger Ring in gold or silvertone. When someone pisses you off, give him a good one with this baby on your middle and ring fingers. He’ll walk around with Brooklyn carved into his forehead for days. To make Salt-N-Pepa proud, Mini Mini Market also boasts a collection of faux-gold doorknocker earrings. You know, the ones with your name spelled out in script in the middle of a massive hoop. Every girl in my Canarsie middle school had a pair. Moving away from the sparkly jewelry case, Mini Mini Market is full of kooky – yet awesomely rockin’ – finds. There’s hot pink sunglasses shaped like hearts, peacock feather earrings, water bottles with apple prints, and wallets emblazoned with images of cats. But c’mon, who doesn’t need a ceramic unicorn? The coolest or most cringe-worthy – depending on who you ask – part about Mini Mini Market’s Brooklyn-themed goods is that they’re likely bought by Williamsburg’s hipsters. Oh, if only they were actually born and bred. Mini Mini Market is located at 218 Bedford Avenue. For hours, call 718-302-9337.